Cash-strapped Chester FC hosted a much-needed fundraiser match as they continue their fight to keep the club alive. 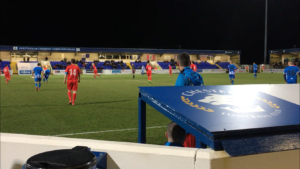 Local football legends, including Ian Rush and Michael Owen, turned up to feature in the event to raise money for Chester FC, who last month revealed they need to raise £50,000 to stay afloat. Most of that total had already been raised prior to last night’s game, but the crowd of 2,080 people helped take the grand total to £75,000, with the match raising £25,000. The teams taking part were a Chester Select XI including former Liverpool striker Owen, and an all-stars side arranged by radio and TV presenter, Colin Murray. He organised the event with the help of Owen and the club, and was pleased with the number of people who turned up to watch. A ceremonial kick-off took place with Michael and his dad Terry passing the ball between each other for Owen Senior to net the opening goal of the game for Murray’s all-stars side. Owen’s team emerged victorious after winning 4-1, with the former Real Madrid star putting the icing on the cake when he added the fourth for his side in the last minute. 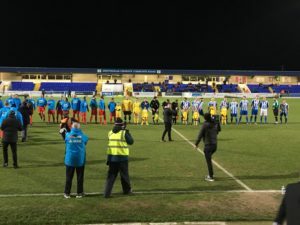 The fundraising didn’t stop after the full-time whistle, however, with the players heading to the bar where they auctioned off signed Chester merchandise. This is the second time in the last 10 years that the club has experienced financial troubles, as Chester City FC dissolved due to money problems in 2010, and reformed in a lower division as Chester FC. Local rivals from across the Welsh border at Wrexham have offered their help, as they will be raising money for their neighbours by organising a bucket collection at their home game on February 24.